Benjamin’s prose is raw and honest, and there is an impressive amount of polish given to the whole. Insomnia has been pieced together using a fragmentary style. Some of Benjamin’s entries span a long paragraph; others consist of a single sentence. Each entry provides a rumination which is, in some way, related to sleeplessness. The central thread which runs through the whole connects each of the fragments together, and it feels almost as though it comes full-circle. In Insomnia, she probes what insomnia really means, and traces such things as the word’s origins, and its interpretations throughout history. She examines different ‘cures’ given to those suffering with insomnia, and draws connections between women sufferers, thought to be mad, being sent to live in asylums. Benjamin moves fluidly between such subjects as religion, mindfulness, nightmares, and ancient folktales, to alchemy, psychology, and representations of the night. I have never, thankfully, suffered with insomnia, but Benjamin’s memoir has given me a real insight into what the experience involves. I had never before thought that losing sleep would have any positive qualities, but Benjamin’s musings have made me reconsider this. I found Insomnia surprisingly moving at times. The relationship between Simenon and his mother was fraught and complicated. This tender and honest letter details their troubled interactions, and his mother’s lack of warmth toward him. He speaks throughout about the unknown events of his mother’s own childhood, which may have caused her to behave in the disconcerting way which she often did. Writing such a letter is a brave act; it seems a shame that his mother was never able to see it. The fortieth Penguin Modern publication is a collection of poetry by William Carlos Williams, entitled Death the Barber. The poems here are ‘filled with bright, unforgettable images… [which] revolutionised American verse, and made him one of the greatest twentieth-century poets.’ I do not recall having read any of Williams’ work prior to this, and was expecting something akin to e.e. cummings. Whilst I was able to draw some similarities between the work of both poets, their work is certainly distinctive and quite vastly different from one another’s. The poems in Death the Barber are taken from various collections published between 1917 and 1962. Whilst I recognised ‘This Is Just to Say’, the rest of the poems here were new to me, and have certainly sparked an interest within me to read more of Williams’ work. There is so much of interest here, and the varied themes and imagery made it really enjoyable. Whilst some of the poems seem simplistic at first, there is a lot of depth to them. I shall end this review with two of my favourite extracts from this brief collection. I adore books about flaneurs; I find them absolutely fascinating. Thus, I was thrilled to come across Franz Hessel’s Walking in Berlin: A Flaneur in the Capital whilst browsing in a bookshop, and purchased a copy immediately. First published in Germany in 1929, it was not until 2016 that Walking in Berlin was translated into English by Amanda DeMarco. Hessel grew up in Berlin, and DeMarco is currently based there, which I feel is a nice and considered touch. Hessel takes his readers on a walk around much of Weimar-era Berlin, splitting his observations into essays relating to particular districts. He takes in ‘some of the most fascinating sights the city has to offer, many of which still exist in some form today’. Many of these sights are seen on foot, as Hessel wove through one street after another, but the odd one was conducted whilst in a car, or on a day-long tour with a lot of Americans. DeMarco writes that ‘Hessel’s knowledge of city history was extensive, gleaned from an art-history education and an avid personal interest in the cultural sediment that had accumulated around him. It is evident in these pages that history was alive and present for him, visible in the architecture. All it took was a glimpse of a statue or bridge or gate to send Hessel conjuring up the figures and era that produced it.’ Despite his knowledge of the city, Hessel wished to present his findings here as though he was coming to Berlin for the first time. The first essay, ‘The Suspect’, begins with Hussel observing people at work, and young girls at play. From his position as a flaneur, he writes of the suspicion which the observed sometimes felt toward him: ‘I attract wary glances whenever I try to play the flaneur among the industrious; I believe they take me for a pickpocket.’ Throughout, Hessel’s voice is chatty, and almost playful. As he continues his journey, he comes across many different people – stocking menders, architects, factory workers, shopkeepers, the rich and the poor, upperclass partygoers, and tour guides, to name but a few. As Hessel makes his way around, he discusses art, literature, culture, and fashion, as well as streets already lost to the annals of time in the 1920s. I love Berlin; when I visited some years ago, I found it a vibrant and hip city, filled with so much history. Hessel’s book has made me want to book plane tickets to explore the city once more, with his notes in hand this time around. Pick up Walking in Berlin, and expect that it will inspire a great wanderlust in you. Hessel describes it, quite rightly, as a city filled with treasures. It was a sheer pleasure to be transported to a Berlin which I half-recognised, and seeing it through the eyes of another brought a delightful freshness. Indeed, Berger decides to travel to Bologna quite some time after his uncle’s death, as it was a place which Edgar held dear. The scenes which unfold on the page are both sumptuous and observant; for instance, Berger writes: ‘I notice that some people crossing the square, when they are more or less at its centre, pause and lean their backs against an invisible wall of an invisible tower of air, which reaches towards the sky, and there they glance upwards to check the clouds or the sky’s emptiness.’ Thus, the history of his uncle, and the history of Bologna, begin to converge. Berger writes about a singular relationship, as well as the relationship which he has with Bologna. The Red Tenda of Bologna is a tender, thoughtful rumination on life and love. It is a small but perfectly formed book, artful and intelligent. The prose is best savoured, written as it is with the all-seeing artist’s eye. 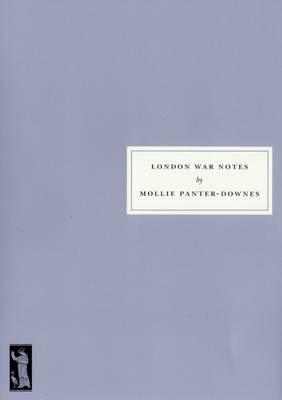 The 111th entry on the Persephone list, and one of this year’s spring reprints, is Mollie Panter-Downes’ excellent London War Notes: 1939-1945. First published in the US in 1971 and the UK in 1972, the collection gathers together material which was originally published in The New Yorker during the Second World War. Between 1939 and 1945, Panter-Downes wrote a regular ‘Letter from London’. These letters began at a pivotal time for Great Britain, as: ‘The first was written on the very Sunday that Neville Chamberlain informed the nation that his untiring efforts to preserve peace had failed’. In all, she contributed 153 such pieces, as well as two dozen short stories, which Persephone have already gathered together in the Good Evening, Mrs Craven collection. Edited by William Shawn, this new edition features a far-reaching preface which has been written by David Kynaston. He believes that Panter-Downes’ humour is ‘wryly observational’, and this volume rightly leaves ‘historians as well as readers forever in her debt’ for the slice of wartime life which it presents. The original American spellings and turns of phrase have been retained within London War Notes, as they ‘give a better sense of the period and of Mollie Panter-Downes’s original audience’. Another nice touch within the book is the way in which it has been split up into sections, each of which refer to different years within the Second World War. Each thus begins with a helpful timeline of the main historical events which occurred in any given year, which are both of importance in general terms, or which had definite consequences within Britain, and thus had major effects upon the populous – the rationing of petrol in September 1939, for example. Robert Harris called Panter-Downes ‘the Jane Austen of the Home Front’, and it is easy to see why. She is incredibly observant and, Kynaston agrees, she ‘deftly and economically makes us feel present without ever resorting to purple prose’. Panter-Downes is a wonderful writer; she is coolly intelligent, and is never one to get flustered. One immediately receives the impression that she was one of those incredibly collected and headstrong women, who always tried to make the best of any given situation. Each of her observations within London War Notes is of value, and never does she under- or overstate anything. Panter-Downes is particularly fabulous at reasserting her own position, and that of her country, against the war at large. She is a thoughtful prose writer, too: ‘The London crowds are cool,’ she writes on the day that war is declared, ‘in spite of thundery weather which does its best to scare everybody by staging unofficial rehearsals for aid raids at the end of breathlessly humid days’. London War Notes is a wonderful and all-encompassing read. It is a fabulous piece of non-fiction, and feels incredibly fitting for the varied Persephone Classics list. As far as journalism – and particularly wartime journalism from the perspective of somebody who was surviving on the Home Front – goes, London War Notes is at the very pinnacle.